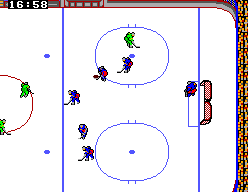 He's streaking down the left side with the puck. 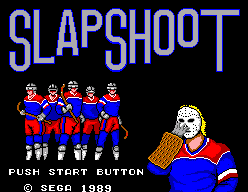 Suddenly, he cuts inside, passes to his teammate in the slot- he shoots, he scores! What a play! 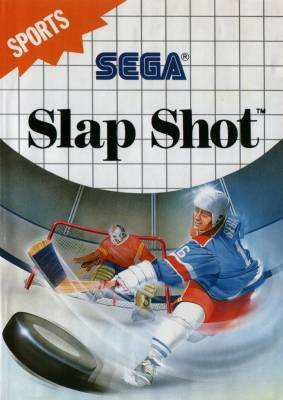 Get all of the hard-hitting excitement of real ice hockey with "Slap Shot"! Shooting, passing, and teamwork on offense, and lots of checking, blocking and general chaos on defense. 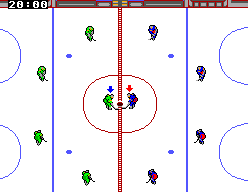 Play an Exhibition game, or enter the Tournament and play against the top teams in the world! Watch out for the other team's goons, though- they like to fight! If you get in a brawl and come out on the losing end, you'll have 2 minutes in the penalty box to lick your wounds. Accept the challenge- take on and defeat the best in hockey. Once you start, you'll be "hooked"!